Are you interested in finding ways to create more shareable visual content quickly and easily? To learn how to create shareable images that enhance your social media marketing, I interview Kim Garst. 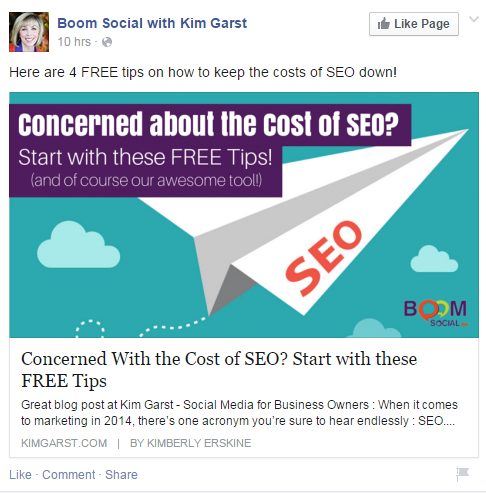 In this episode I interview Kim Garst, CEO of Boom Social, a social media marketing consultancy. 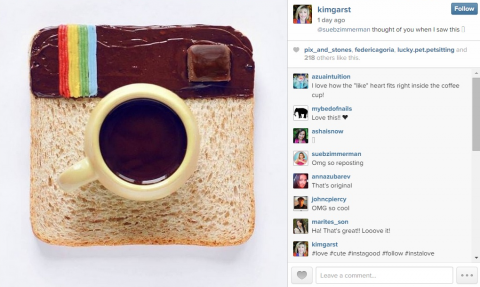 Kim’s also an expert in using visuals for social media marketing. She’s the author of a new book, Will the Real You Please Stand Up: Show Up, Be Authentic, and Prosper in Social Media. 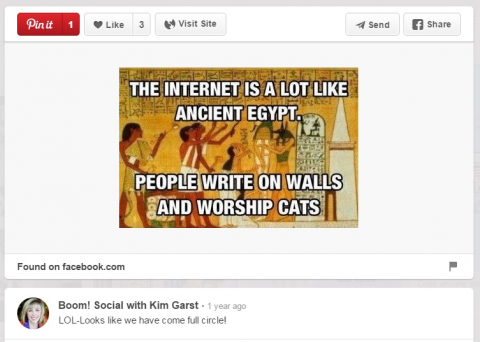 Kim explores visual content and how it can enhance your social media marketing. You’ll discover the importance of using visual content in your social media marketing; the different types of visual content you can create for your brand or business; and the best tools, apps and resources for creating visual content at your desktop or on the go. 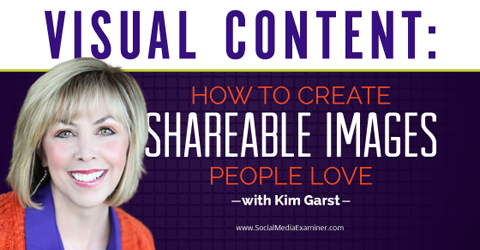 Listen as Kim Garst shares how to create shareable images people love. Visual content marketing is a way to use images, rather than words, to communicate a message about your business, product or service. Visuals are a snackable way to express ideas. Visuals are a huge part of social media and they continue to evolve. People are so busy today. Images catch their attention and are quicker and easier to process than text as they scroll through a social media feed. Visuals are a snackable way to express ideas. Beyond leveraging social media platforms typically known to be visual (Pinterest and Instagram), Kim also looks for ways to implement visuals and eye-popping graphics in her Twitter content strategy and on her blog. 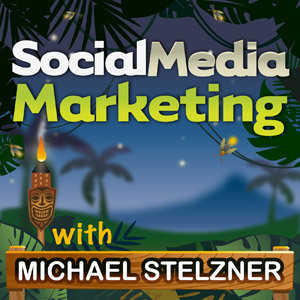 Listen to the show to discover more ways to leverage visual content in your social media marketing. From a social media marketing standpoint, the old saying that “a picture’s worth a thousand words” holds so much value today. As marketers, we all need to be or become storytellers. A great photo or graphic tells a story in one hot second. Use a great graphic or image to tell your story instantly. We live in such an information-overloaded space right now and attention spans are so short. Text-based marketing alone has become less and less effective. The brain processes visuals 60,000 times faster than text. A good image can connect an idea or message much quicker and stronger than text-only content. Listen to the show to find out other amazing stats for the effectiveness of visual content on what your audience will process, learn and retain. There are five primary types of visual content you can create for social media: videos, photos, creative images, infographics and slide shows. Kim explains that comics, memes and infographics tend to be hugely popular on social media. Comics and memes are a way to showcase humor. They’re fun and relatable, so people are eager to share them with their friends and family. People are eager to share something humorous and relatable with friends and family. According to Kim, businesses that use infographics probably have a 12% higher growth rate than companies that don’t. Infographics offer a visual way to share a lot of interesting content in one image. People love them too. The most popular place to get more bang from your infographics is on Pinterest. People share them there like mad. Another great place to leverage infographics is on blogs. An infographic doesn’t necessarily have to be complex to be appealing and effective. For example, if you have a blog post that’s about 10 ways to do something, then you could repurpose your blog content and very easily make an infographic on those 10 ways. Infographics take a lot of content and make it visual and sharable. You’ll hear Kim explain how sharing a mix of visual content that’s outside of, or seemingly unrelated to, your product or service can actually help build a community and drive sales, engagement and exposure for your brand. Listen to the show to learn the powerful business objective and strategy behind creating a variety of images for your brand or company. Creating visual content might be a challenge for someone who is not a designer. Kim offers several tools and resources to help you easily create shareable images even if you’re not creative or artsy. Knowing what colors and fonts to use in your images can make a huge difference and it’s all in the tools. Kim uses Google Fonts and Dafont to find fonts. Both sites offer many individual fonts that are all free, searchable and available for download. Google Fonts offers a backend system of fonts that are free, searchable and available to download. To help you choose the correct colors, Kim uses three unique resources: Design Seeds, Adobe Kuler (now known as Adobe Color CC) and Pictaculous. You’ll hear Kim explain how she uses each of these sites to find the perfect palette for her social media images. 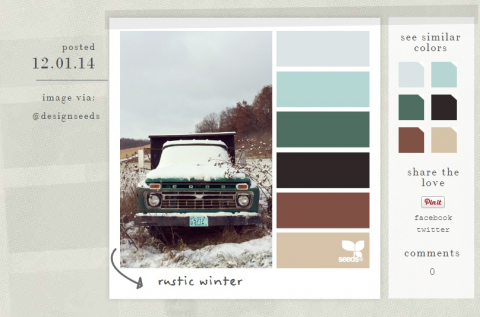 Design Seeds showcases color palettes in a photo so you can see how they look together. Kim originally used Photoshop to create all of her images, but realized this program can be complicated and daunting to most people. In the show, Kim offers three simple and easy-to-use alternatives to Photoshop to generate beautiful images, both at your desktop and on the go. Listen to the show to discover the other tools, apps and resources Kim uses to create amazing images. Do you notice the links from your website Google recommends when you do a search for your company or product? Are you wondering how you could remove or edit which site links Google shows for your company? Have you heard about Google Webmaster Tools? Google Webmaster Tools lets you to do a lot of cool things with your website like research data and keyword searches for your site. It even scans and notifies you of errors, malware or other issues with your site. Once you’ve set up your site on Google Webmaster Tools, you will have access to a feature called Search Appearance. This feature shows what appears when a Google search is returned with your site. In the menu beneath Search Appearance, a tool called Sitelinks allows you to select which pages of your site will show up in Google’s search results as a recommended link. You can demote or promote specific sub-links from your website and hide others. Listen to the show to learn more and let us know how Google’s Webmaster Tools works for you. In the show, you€™ll hear about Kim’s experience at Social Media Marketing World. Kim spoke at Social Media Marketing World 2014 and will be speaking again this year. She calls it the best social media event that she has ever been to, bar none, and says it’s a great place to network and learn from the top social media experts in the world. She simply can’t recommend it more highly. Social Media Marketing World 2015 has a lot going for it with the great content, excellent presenters and valuable networking opportunities. Another reason people come is because it happens to be taking place during spring break for families around the globe. Take your social media marketing to the next level and join us in warm, sunny, beautiful San Diego, California on March 25, 26 and 27, 2015. Hundreds of people have already secured their tickets. Click here to check out all of the speakers and the agenda, watch our video and grab your tickets today. Connect with Kim on her website, LinkedIn or Facebook. Follow Kim on Twitter, Pinterest and Instagram. Read Will the Real You Please Stand Up: Show Up, Be Authentic, and Prosper in Social Media. Find out more about Joshua Parkinson’s fishing analogy in How to Use Facebook to Drive Traffic to Your Website and Get More Customers on Post Planner. Learn more about the fonts found at Google Fonts and Dafont. Discover color palettes on Design Seeds, Adobe Kuler (now known as Adobe Color CC) and Pictaculous. Try out these photo editing apps for your phone: InstaQuote, Rhonna Designs and Word Swag. Check out the Sitelinks feature from Google Webmaster Tools. What do you think? What are your thoughts on creating shareable images? Please leave your comments below.